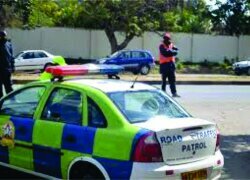 THE Road Transport and Safety Agency (RTSA) breached the Road Traffic Act No.11 of 2002 when it decided to suspend operating licences for Mazhandu and Wada Chovu bus services for causing deaths by dangerous driving, Parliament heard. And the House also heard that a Bill for a more robust system for impounding vehicles and efficient disposal of uncollected vehicles after a stipulated period of time by the Road Transport and Safety Agency (RTSA) would be presented before Parliament soon after Cabinet’s approval. Minister of Transport and Communications Kapembwa Simbao said after presenting a ministerial statement on road traffic accidents that he decided to overrule RTSA’s decision because it was based on emotions and not the law. Responding to MMD Mafinga Member of Parliament Catherine Namugala who wanted to know why the Minister (Simbao) overruled a seemingly good decision by RTSA, Mr Simbao explained that emotionally RTSA was right but legally wrong going by Road Traffic Act No.11 of 2002. He said he was empowered to overrule such decisions as minister-in-charge whenever the Road Traffic Act No.11 of 2002 was not followed. “Mr Speaker, if RTSA had followed the law, I would not have overruled their decisions,” Mr Simbao said. Earlier, Mr Simbao said his ministry had proposed some amendments to the Road Traffic Act Number No.11 of 2002 and a Bill had been submitted to Cabinet. He said some of the amendments would include intensified road user education and enforcement so as to greatly influence human behaviour and the introduction of regulations to curb over-speeding using global positioning system and other ICT monitoring devices. Mr Simbao said the amendments would further seek to improve road signage on all roads in order to improve communication with road users. “Government shall review the regulations relating to driving under the influence of alcohol or drugs so that these cases are easier to prosecute,” he said. Mr Simbao said government shall annually present an accident report to Parliament so that focus on the matter was not left to chance. Meanwhile, Mr Simbao said on the floor of the House that the major cause of accidents in Zambia was human error accounting for 87.3 per cent across the country. “Other major causes include vehicle condition at 1.5 per cent, animal conflict at 1.1 per cent and road condition at 0.4 percent while bad weather condition accounts for 0.1 per cent and other causes account for 9.6 per cent,” Mr Simbao said.